As everyone who has ever been to a wedding, planned a wedding or gotten married will know, the day you finally tie the knot is about more than just the ceremony. While this is when you exchange your vows and declare your love and commitment in front of all your friends and family, the reception is your chance to celebrate your new union and revel in your newly-minted status as a married couple! However, before the party can begin there is a lot of planning that needs to be done. From seating arrangements and party favours to centrepieces and the all-important drinks menu, the number of jobs on your to-do list can really stack up. This can leave you feeling uninspired, creatively drained, and considering an understated elopement… But don’t throw away your party heels just yet! We’ve put together a few easy (yet spectacular!) 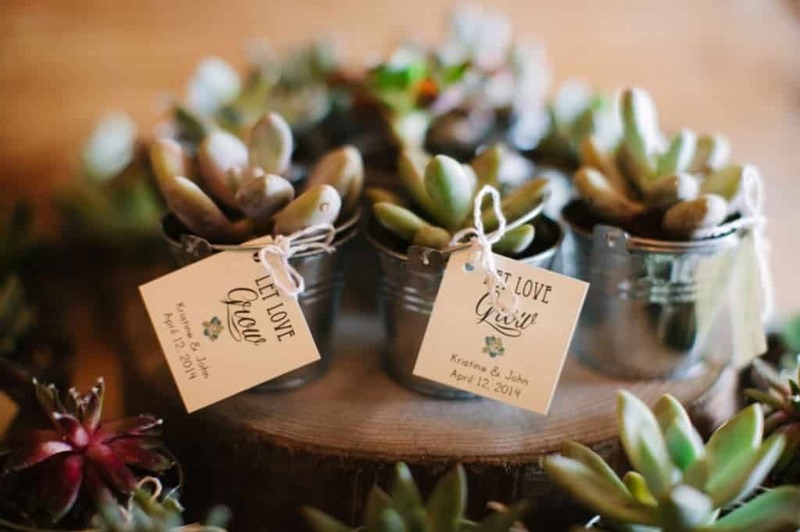 wedding reception ideas to help you forego the reception planning stress and to help make your big day that little bit more special. If there’s one thing you can expect for your reception, it’s that your guests will be snapping photos all night! 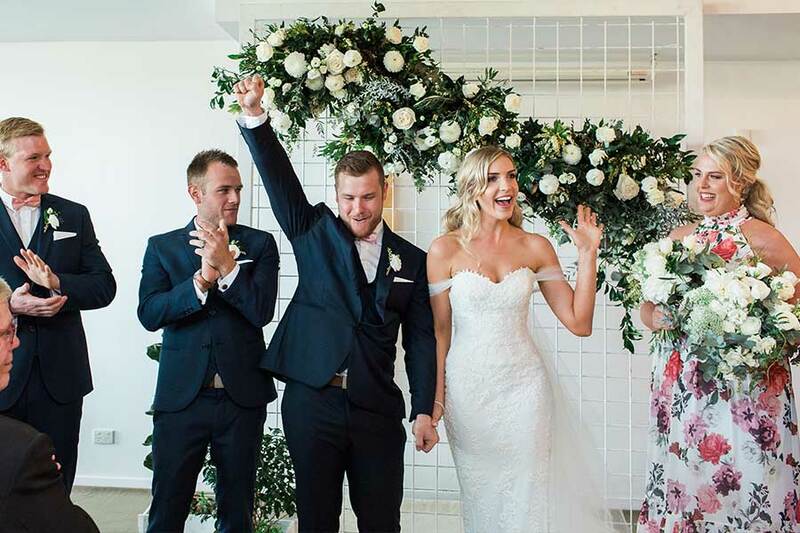 Yes, even your elderly uncle who’s not really sure how smart phones work… Particularly if you’ve provided your guest with a personalised Instagram hashtag for your grand event, it’s a great idea to make sure you have a few Insta-worthy backdrops that your guests can use in their snapshots. From floral walls to neon signs, this is one of our favourite wedding reception ideas. If the bridal party is going to be absent between the ceremony and reception getting photos taken, it’s a great idea to provide some entertainment for your guests (in addition to wine and cheese, of course). Lawn games are a fantastic way to keep your guests entertained, and are suitable for the young and young-at-heart alike. Plus, for a little extra pizazz, it’s easy to customise and DIY lawn games. Why not set up a large-scale noughts and crosses using pictures of yours and your partners faces instead? While it may seem like a bit of a no-brainer, it’s important to remember that the location of your reception is one of the most important things to consider. To make your wedding reception special, try to choose a venue that suits you and your partner. At Victoria Park, we have five stunning spaces to choose from, no matter how intimate or grand your affair. 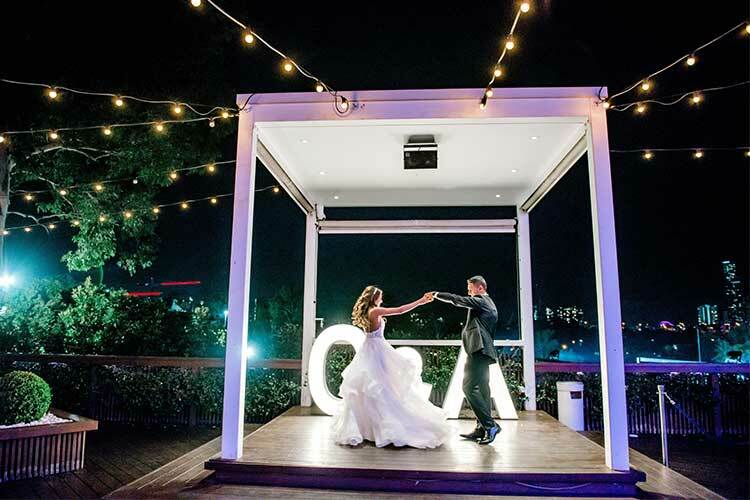 With sweeping views of Brisbane City skyline and Victoria Park Golf Course, we can offer you and your guests a stunning location that is luxurious yet simplistic – the perfect destination for a Brisbane wedding reception! Plus, if you need a little extra help to make sure your wedding reception is everything you’ve ever dreamed of (and more! ), our team of expert wedding planners can help you bring all the pieces together for a truly spectacular day. One of the most important (yet often overlooked) aspects of your reception are party favours. Some of our favourite ideas are mini champagne bottles with custom labels, handmade soaps and candles, personalised tea towels or beach towels, macarons, and personalised cookies. We promise this is the ultimate way to make your wedding reception that little bit more special for you and your guests. One of the highlights of any good reception is the dancefloor & tunes. Giving your guests the chance to groove the night away is a sure-fire way to keep the atmosphere high (and to score some funny snapshots). If you’d rather not spend your budget on a live band or DJ, then opt for a carefully curated Spotify playlist and entrust someone with the responsibility of keeping the tunes flowing. Fill your playlist with songs that mean something to you and your partner, and don’t be afraid to show off your moves. As much as you may be tempted to jump on the latest wedding trend for your special day (such as geometric designs or cupcake towers), it’s always a good idea to make sure you’re designing your wedding and reception to be true to you and your partner. When in doubt, keep things simple and personal. But in saying that, don’t be afraid to do things unconventionally either! Your wedding reception is all about celebrating your joyous marriage and this won’t change regardless of what table centrepieces you choose. 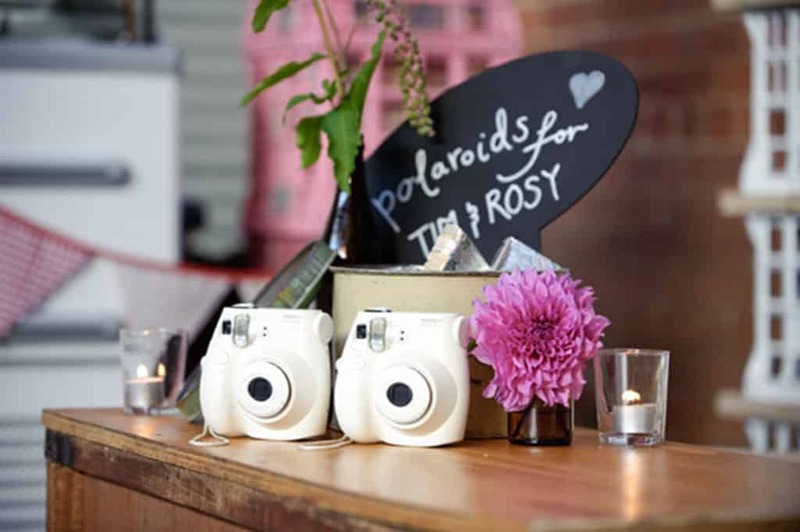 Paying close attention to a few small details is an easy way to ensure your wedding reception is unique and personalised to you and your guests. Where possible, customise! Monogrammed serviettes, photo booth props, a unique guest book for your guests to leave you special notes, a special kids-zone for the younger guests, creative wedding favours – these small details are the things that will really make your wedding reception unique and special to you. Thanks for reading! View ourwedding packages for more information on holding a wedding in one of our 5 stunning venues.